WHAT DO YOU SEE AT FIRST GLANCE? Print this PDF and color that shape in as many places as you see it. Then post a picture of your drawing to Instagram with the hashtag #geocolordeca. Print this PDF and color that shape in as many places as you see it. Then post a picture of your drawing to Instagram with the hashtag #geocolorocto. Print this PDF and color that shape in as many places as you see it. Then post a picture of your drawing to Instagram with the hashtag #geocolorhex. The other day my nephews were rough-housing on the trampoline and went crashing into the safety net that surrounds it. Unfortunately for one of them, several of the straps that hold the net to the poles broke and he went head-first onto the ground. Luckily, he wasn’t hurt, but it did leave the net in shambles. Pinterest is full of creative ideas about how to display your ‘analog’ photos and I’ve got my own version. I found a stash of 18-wheeler trainer flooring from a renovation in downtown Little Rock, AR. 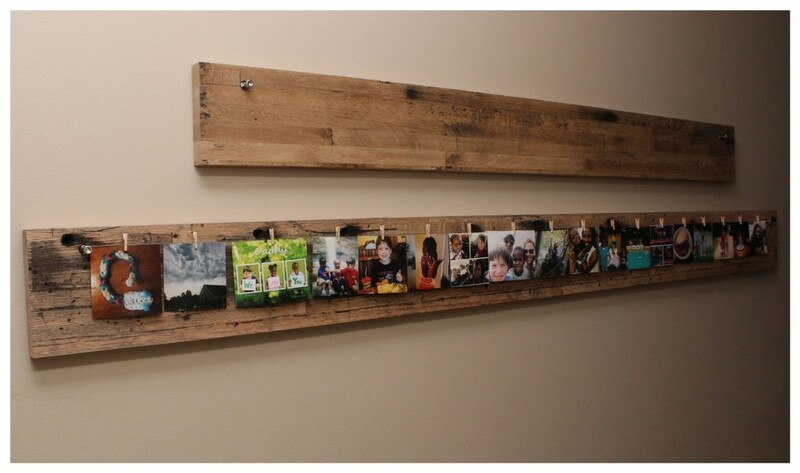 It’s 1.25″ thick and made up of oak strips glued up to 12″ – 16″ wide planks and anywhere from 4′ – 12′ long. These boards are called “million mile wood” due to being back and forth across the US multiple times on the hauling runs for these truckers. So, I’m calling this product “Million Mile Memories” in reference to the story behind the wood’s history. 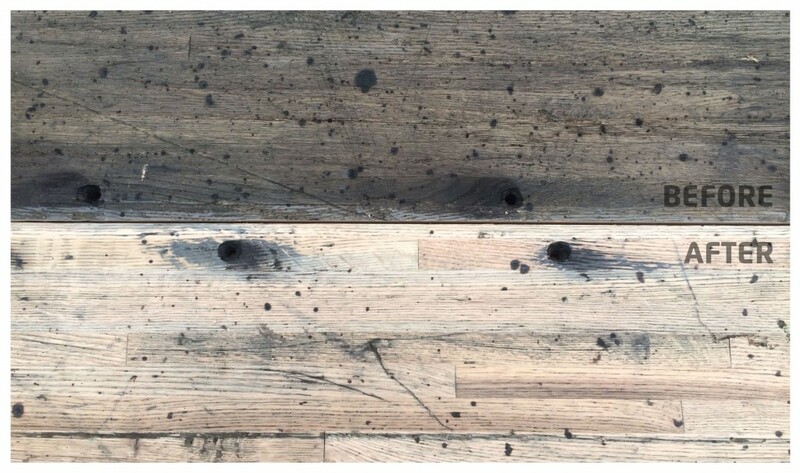 These boards, as you can imagine from flooring, are rough and appear heavily worn from the various cargo being hauled. Here is a before and after shot from a pass or two through the planer. Yes, those are burn pot marks – who knows how that happened in the back of a semi trailer. Now that the wood has been cut to width, surfaced and squared off on the ends, it’s time to add the picture hanging mechanism. The concept I wanted to achieve was to stretch a metal wire along the length with enough tension to prevent sagging when the pictures have been hung. I wanted a system that could support one length of wire instead of multiple shorter lengths. 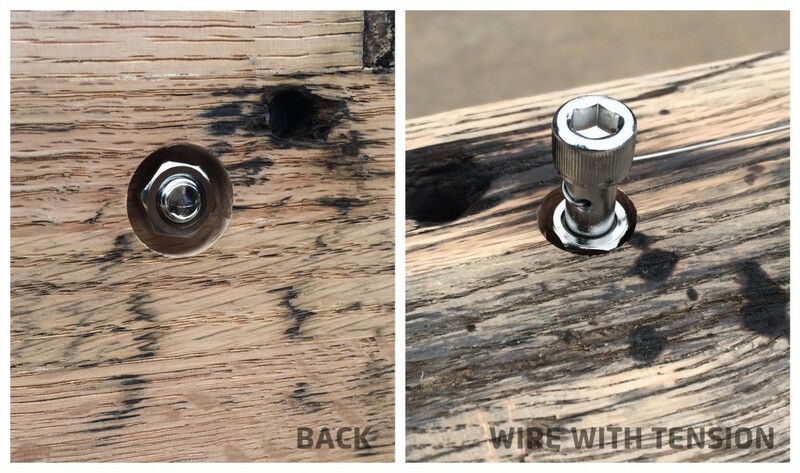 I chose some cool chromed hex-head bolts and nuts mounted into countersunk holes and then a standard keyhole hanger, but the challenge of how to apply enough tension still needed some ingenuity. 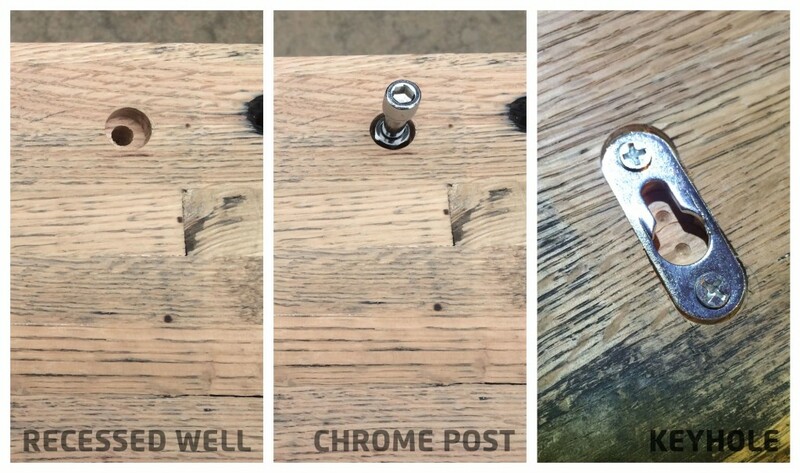 These bolts have an un-threaded section near the head, which gave me a great idea. I wanted to use the bolt itself as a way to add tension, so I drilled a small hole through the bolt’s shaft. This allowed me to pass the wire through and secure it to the bolt. I could then turn the bolt with an allen wrench to add just the right amount of tension. A second nut on the back allowed me to secure the bolt enough to prevent it from turning back. After two failed attempts (one with a smaller gauge wire and one with too much tension), I finally got the result I wanted. It didn’t take much tension to support the weight of the pictures, but without the hole in the bolt shaft, I would have never been able to pull it tight enough by hand. The results speak for themselves – a custom way to hang pictures and bring some life to a barren wall. What you see is a 60″ on top and a 80″ on bottom. I have enough wood to make more and can custom make it to suit your needs in both board width and length. Comment below or message me on Facebook if you’d like to commission a custom picture display for your home or office.